I got them all and then some. Mumps twice (I don’t remember the details but I had a quirky double dip on mumps) chicken pox measles and I also had my tonsils out twice. They grew back was the explaination. I had pneumonia and then double pneumonia that kept me out of school for a long time in 4thnand 5th grade. I got a Tudor and was way ahead in most classes by time I got back. I was sick a lot as a kid with ear infections and other maladies I would talk my way through so I wouldn’t mis out on the life going on beyond my doors. I didn’t enjoy being cooped up. 30 years ago I started to go to homeopathic doctors when my kids were way too frequent visitors,at the pediatrician. We were there every every every week. A friend was just out of doctor school and got us started on this path and my kids were never in a pediatricians office again. The homeopath I ended up with discussed vaccinations and said mmr was unavoidable but ones like the flu and some others were a risk that seemed about as high as the risk of not taking the shot. We are the non shot takers for the most part but I have gotten the flu and the shingles shot recently offered. I don’t feel real strongly about it just kind of lean toward no. Cvs and Walgreens had a big push on flu shots this year. I got asked 50 times. Of course I’m old now and go to the drug store,multiple times a month to give the, reason to target me. It is reassuring to see tim returning to the form he made famous on this site. Some of his recent posts have been disturbingly correct. But today he reports he missed school with pneumonia, so he “got a Tudor.” Happily enough, it apparently wasn’t Henry VIII! What Tudor would you recommend? I’ve tried without success to find a Tudor I like. They were a famously dysfunctional family, only instead of throwing crockery at each other they were big on beheading. I find that off-putting. Forgot to say – favorite Far Side Cartoon. When my sister had her appendix out, she missed a lot of school. But she had a tutor come to the house, not a Tudor. The effects of those diseases were devastating to some here. It doesn’t happen so much any more due to improved medical care when complications arise. I was relieved that our grandson wasn’t hospitalized with the RSV. The child one of their coworker was in hospital with twice last week. A serious respiratory virus Respiratory Syncytial Virus. It is usually just a really bad cold. Grandson needed a nebulizer to keep his lungs clear. The twins both had RSV at the same time when they were babies. Didn’t have to be in the hospital but doing the nebulizer for them around the clock was quite the chore. When I was a kid vaccinations were a big deal. Shots used to hurt more than they do now. My guess is that today’s needles are finer. We used to get shots in our butts, which meant the shot was humiliating as well as painful. I was born a year too early to get a polio vaccination. That began when I was 13, but the vaccine came too late for me. I had a mild case of polio that left no aftereffects, although it terrified my poor mother. In the forties and fifties when you got one of the famous communicable diseases you would be quarantined. Health officials would staple a note to your front door warning everyone that a sick kid was inside, so people shouldn’t enter the home. Our signs were yellow. It was so weird being a quarantined kid. You were a prisoner of your home, looking out the windows at a world you couldn’t join because you had some disgusting malady. I was quarantined about three times. I’m a passionate advocate of vaccinations. For me, refusing vaccinations for your kids is as stupid as refusing to acknowledge climate change. I had chicken pox as a kid – it swept through the neighborhood. Mostly remember having to take baking soda baths to help with the itching. Neither the baths nor the pox were pleasant. Glad I could vaccinate Daughter for it. Both she and I got all the other available ones. I am pro-vax (clearly) – the benefits are too large to ignore, and the risks of not vaccinating too great. I know folks, including at least one of Daughter’s friends, who are not able to get vaccines due to comporomised immune systems or allergic reactions (though non-egg based flu shots seem to be a game changer) – I figure we are not only helping ourselves, we are helping the herd. It boggles my mind that measles and mumps, which were pretty much eradicated, are coming back. Also boggles my mind that people still cling to a long de-bunked article with specious information to prop up their fear of vaccinations. Science, people – real science – says these things work. My father missed a year of school when he was 8 because of pneumonia and its aftermath. I remember the oral polio vaccine-given in a paper cup. We were vaccinated en masse at school in the gym. We all lined up, and the dramatic girls fainted. I fail to see the logic of parents worried about autism who refuse shots for their children even after their children are in elementary school. Its too late to get that condition when children are that old. I had measles, mumps, and rubella. Never had a clinical case of chicken pox despite both my sisters having it and Mom making an effort to expose me to them. Somewhere along the line I was either exposed enough or had a subclinical case because I am immune now. The so-called benign children’s illnesses are not so benign, especially when developing them as an older child or adult. And these illnesses are devastating to those who are immunocompromised or those who, for whatever reason, cannot be vaccinated. For me (a retired RN), it’s a no-brainer. I have had all the vaccines I am eligible for and will continue to get yearly flu vaccines. I was away in Iowa on internship for the year our son was in Kindergarten. He got the chicken pox, and Husband did admirably dealing with it on his own. I believe I had all the “popular” childhood diseases. Don’t remember much about them except usually feeling miserable and feeling weird about missing school (like the coolest thing ever was going to occur on a day I was sick!). I’m okay with vaccinations if the vaccine is basically harmless. I worry about society’s rush to disinfect everything in sight and our belief that avoiding all illnesses at all costs should be a world goal. My opinion is, a little sickness now and then is a good thing because our immune systems need to work once in a while to “stay in shape.” Plus, it’s a fact of nature that viruses and bacteria are constantly evolving and adapting and will eventually figure out a way to spread through humans or food animals like wildfire. Doesn’t it make sense to give our bodies a bit of practice in defending ourselves? I’m not saying rush down to the nearest hospital and french kiss every patient who has a communicable disease. Just eat a bit of dirt once a year, don’t buy antibacterial everything, and don’t freak out if someone sneezes within five feet of you. I agree about nixing tbe antibacterial soap. I remember getting measles the day before easter vacation started. I spent all of vacation sick in bed then was well enough to go back to school when vacation was over. I was not happy about that. I have strong feelings about vaccinations – I’m all for them. We had a measles outbreak here in Minneapolis a few years ago and I was infuriated to find out that the anti-vaxxers had targeted a certain immigrant group (many of whom live in my neighborhood) to “educate” them about the evils of vaccination, resulting in a very low rate of those kids getting vaccines and many of them ending up in the hospital when they got the measles. While I appreciate and live by a similar philosophy to Chris of not worrying overmuch about germs and not using antibacterial soap, etc., vaccines for serious illnesses are a good thing IMO. I wonder how many anti-vaxxers would really like to go back to the days when polio and other diseases were common and crippling kids and causing serious harm (like death)? I have a personal interest in this – if and when I go through the stem cell transplant, my childhood vaccines will be wiped out and I’ll have to get them again, but not until at least 6 months after the transplant. I’m old enough that I didn’t get as many shots as are available now, and I don’t know if the effect of being immune from actually getting the disease will also be wiped out, but I’ll definitely be in the camp of being immune compromised. I would really like it if enough people were getting vaccines that I could depend on the immunity of the herd to protect me from diseases that I would prefer to avoid. That’s very interesting that all your childhood vaccines will be gone. I know… it’s kinda weird. I also can’t garden for several months after and a few other things I don’t remember now. It will change my life that’s for sure. Hopefully it will be worth it. I’ve been in the position of being immuno-suppressed and at risk for infection. It gives you a different perspective. I imagine it does, Linda. I do agree with Chris about society being so obsessed with disinfecting everything. Our immune systems do need a work out. The vaccines I refer to concern diseases with serious consequences that are also highly contagious. Herd immunity for these is a good thing. The Anonymous is K two. Posting from my iPad instead of laptop. I remember when there was a rubella outbreak in the 60’s and 70’s and some pregnant women contracted it and their babies were born with birth defects as a result. all. My sister and I both had chickenpox at the same time while at the boarding school. We were quarantined to a makeshift sickbay on the fourth floor of the school. This I remember vividly because of an unusual circumstance. It was 1952, I was nine and my sister seven. At the time murders were rare in Denmark, but a few years earlier,1949, a murder had occurred on the neighboring island of Lolland; the details of the crime had captured the entire country. In 1952 the convicted murderer had somehow escaped prison and was on the lam. Our sickbay was in a remote corner of the top floor of the school, far removed from all the activities a couple of floors below. Every time we heard the slightest noise, or the floor creek of the vast expanse of the loft outside our room, Randi and I would hide under our comforters, sure that “Kældenes morderen” was lurking in the loft. To this day reminiscing about this will send us both into fits of laughter. About vaccines, I’m a strong advocate for vaccinating whenever necessary. As a child I was vaccinated against smallpox and tetanus while still living in England. After moving to Denmark mandatory vaccinations against tuberculosis, and diphtheria followed. The oral vaccine against polio was first administered in my school in 1956 on a sugar cube! Vaccinations against smallpox and tuberculosis are no longer mandatory in Denmark. Smallpox, of course, has been eradicated, and tuberculosis is longer prevalent there. Of all of the vaccinations, the one most dreaded was the diphtheria shot. It was administered in the back of the shoulder, and in a matter of days your arm and shoulder would be so sore you could barely lift your arm. Because I had chickenpox I thought it wise to get a shot for shingles, although I learned after I had shelled out a considerable sum for it, that it’s only about 51% effective. The flu vaccine I get on a hit and miss basis. Again, it’s pretty much a crap shoot whether or not the annual shot is going to be effective against whatever strain of the flu makes itself known on any given year. Knock on wood, I haven’t had the flu in years. I had the sugar cube, too. I had forgot about the smallpox vaccine. I can still see the faint scar from it on my arm. I had the sugar cube for polio. I don’t have a smallpox vaccination scar, though. My sister has one. I’ll play devil’s advocate here – I am afraid I’m one of the dreaded anti-vaxers. We are not all uneducated, some of us just read different materials than the mainstream. I am not well-versed enough to speak intelligently without a “prop”, but I wish you all could read the article found in Well Being Journal January 2018: “Vaccines: The Clinical Perspective” by Harvard-educated MD Richard Moskowitz (now also a Homeopathic specialist) who wrote the book Vaccines: A Reappraisal. If anyone is interested, I would gladly send you the article… let me know here if you need my email address. I received most of the childhood vaccines given in the 50s without ill effects. I had two kinds of measles, chicken pox. After Joel had a strong reaction to his first DPT, I had them give him a DT for the next time. But by the time MMR came out, I had read enough to opt out. I am trying lately to be more open-minded about vaccinating, but for now I won’t touch one. I believe that giving SO MANY vaccines renders our immune systems sorely compromised to fend off diseases that they could otherwise naturally resist. Son had a reaction to the DPT shot when he was small, but now can get the whole shot. He doesn’t want to get whooping cough. Our landlords in Winnipeg were immigrants from southern Italy. Angela, the wife, had 3 or 4 smallpox vaccination scars on her upper arm. Why would a person need more than one smallpox shot? Clin Med Res. 2003 Apr; 1(2): 87–92. The other scar is from the tuberculosis inoculation, and that one is also round, but slightly raised. I don’t know of any reason why anyone would need more than one smallpox vaccine. Once a year all through school, we’d all receive a shot on the outside of the lower arm to test that our tuberculosis inoculation was still working. A couple of days after the shot, they’d look at and measure the spot where we’d received the shot. If our immunization was still working, a raised, warm red spot, much like a mosquito bite, would have formed, and would gradually fade away. If your reaction to this test wasn’t sufficiently positive, you’d receive a booster shot. Thankfully, I never needed one. This is apparently the same test that is administered to people in nursing homes or rehab facilities in the US to make sure they don’t have TB. Except here, my positive reaction, desired in Denmark, would raise all kinds of red flags. That was why I adamantly refused to let them give me that test. I had enough problems without them thinking I had TB. The TB test is called a Manitou, I believe. I don’t react to a Manitou, but I don’t think I was vaccinated for tuberculosis. No reaction is considered a good thing, at least for me. Most Americans aren’t Linda, but all Danes of my vintage were. Just an FYI – it is a Mantoux test, also known as a PPD (purified protein derivative). Thanks, K-two. Another day that I learned something new on the trail. I never knew there was a tb shot. I always have an allergic skin reaction to the manitou test which looks like I test positive. The woman who wrote it, a doctor, later said she was tired and frustrated and emotional at the time, so it was perhaps more dramatic than she intended, but true nonetheless. I can understand her frustration, and yet, I can also understand the lack of trust in the authorities we depend on to ensure vaccines and other medications are safe. 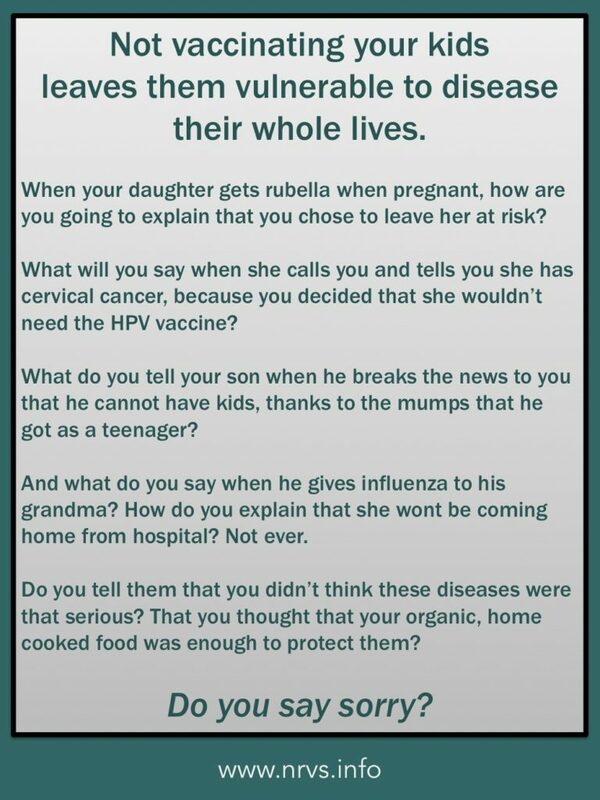 Unfortunately, the decision to not vaccinate your children doesn’t just affect them, it affects their classmates, their families, and the entire broader community they may be exposed to. I had chickenpox as a kid, but don’t remember very much about it, just a vague memory of having the red spots. There wasn’t a vaccine then, of course. Developed shingles when I was 50. A co-worker of mine developed shingles that came extremely close to her optic nerve, and could have resulted in blindness if she hadn’t been treated in time. Her doctor is sufficiently worried about it that he wants her to take acyclovir for the rest of her life. A caveat – I am more amenable to vaccines with an apparently high percentage of effectiveness, like Measles vaccine, than to flu vaccines with their relatively mediocre percentages. I agree it is heartbreaking to read of children (or adults) whose lives are impaired by the disease. It is equally heartbreaking to read of people who have been incapacitated or who have died from, i.e., liver damage from getting a vaccine – not a great percentage, but the numbers would surprise you, and you won’t hear much about them (unless you go looking for the information) due to the powers that be in our country. I’d be interested which vaccines have resulted in liver disease or death, BiR. Do you know? And what would you consider a good resource for checking that information? I mis-spoke – just checked my article and it was renal (kidney) failure associated mainly with flu vaccines. I’ll email you tomorrow with some sources. Thanks, BiR, I appreciate it. I hope enough people will opt for vaccinations to actually eradicate some of these diseases, so that future generations won’t need as many vaccinations. Kids today don’t have to have smallpox vaccinations because previous generations took the risk and vaccinated. Flue will probably never be eradicated – it just keeps coming back in a slightly different form. And that’s one of the reasons that the flu vaccines aren’t as effective as some other vaccines. They just can’t predict the exact strain of the virus that will show up any given year. I just love and appreciate the measured and loving Baboon responses to controversial issues.